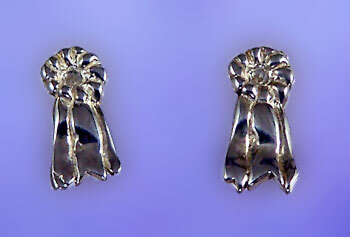 "Small Ribbon Earrings in Sterling Silver"
Great for the young winner and rider! Sterling silver ribbon earrings light weight and great for showing in! The Gorgeous Horse your number one source for equestrian jewelry. These little ribbons would be great for the little rider, or the champion in you. Check out all of our ribbon earrings and pendants throughout the site with all types of variations and even decorated with gemstones. Dimensions: 1/4 inches wide x 5/8 inches tall. Available in 14kt yellow, 14kt white gold, or sterling silver. For the first place winner request sapphires to be added by using our request and comments box below!